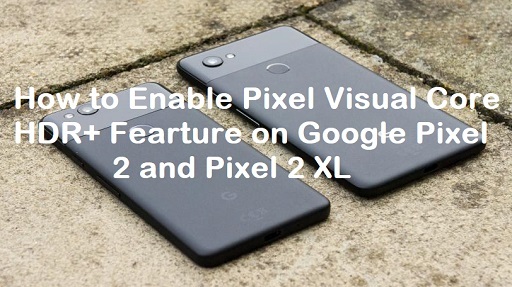 Shortly after the release of Pixel 2, Google announced that its two new smartphones had built-in a built-in chip built-in which will be used specifically for special processes like HDR + image processing. Pixel 2 was announced in October this year and comes with advanced hardware. It includes a series of free software features, including active ages, always-on-display, Google lenses, unlimited photo storage and world-class camera. Strangely, however, Google did not turn on this pixel visual core, when it sent its flagship device with Android 8.1 Developer Preview , If you are eager to improve the quality of your device’s camera, then you have a chance to enable the pixel visual core on Google Pixel 2 and Pixel 2XL. Enable the Developer Option:- Navigate to Settings menu >> System>> About phone>> Build number and tap on it multiple times until it says Developer options have been enabled. Now Go to the Settings >> System >> Developer options. Make sure that the Developer options is toggled on and scroll down until you find the Debugging subheading. Now at the bottom, locate Camera HAL HDR+ and toggle it on. A pop-up will appear letting you know that you must have to restart your device before the Pixel Visual Core can begin working. After the feature is enabled, you will need to use a third-party app to see the feature in the feature. These third-party applications should rely on the Android camera API instead of the inbuilt camera app. It is likely that you will not see any major differences in the quality of the camera so far. The reason for this is that the time has come for all the bits of all processors to work on Google’s software finishing. If you have any questions about pixel visual core, then let us know through the comments.